This award will be presented to a “business/business owner” which actively works towards making our community an even friendlier, safer and more responsive place to live. 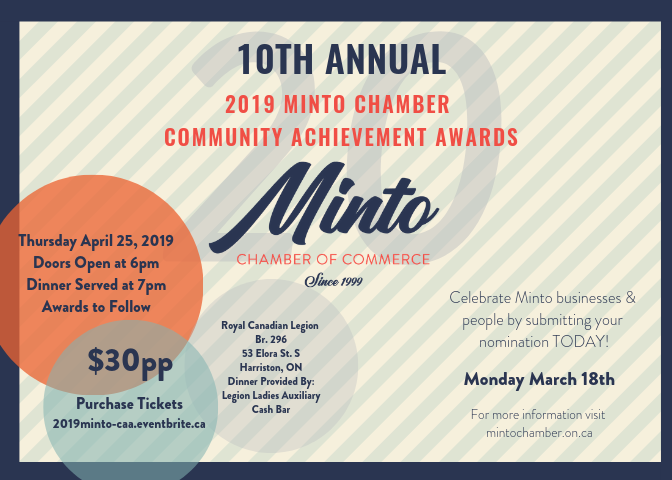 This award will be presented to a company which has had an impact on the Minto Community and has more than 10 employees. This award will be presented to a company which has had an impact on the Minto Community and has 10 or less employees. This award will be presented to a young entrepreneur who is 35 years of age or younger. This young entrepreneur is self-employed, has shown initiative and innovation in a business venture, has introduced a new product or new idea and need not have been involved in a year-round business. This award will be presented to a “business” who has provided exceptional customer service by consistently offering a high quality of service to all customers and by going above and beyond the call of duty to provide service to a customer in extenuating circumstances. This award will be presented to a youth ages 13-19yrs that resides in Minto. This youth takes initiative in the community by way of volunteerism, engagement in organizations and/or activities and is a strong role model for peers. Preference may be given to students who are members of the Minto Youth Action Council.